If you like video guidance, I made this on Instagram Stories. If you serve this with rice, get that going first. I’ve been making Perfect Instant Pot Brown Rice; just the rice part, not the dressing. You need a wide pot or pan with a lid for this recipe. The wide shape of the wok is nice because the cooling rack can rest higher up in the pan, allowing water to simmer beneath it without hitting the fish. A whole fish fits nicely inside it, too. Depending on the size of your fish, you will need to adjust the timing. 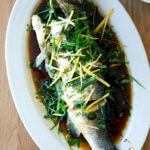 I’ve been using Branzino, and each Branzino has weighed about 1.25-1.5 lbs. For this size fish, 9 to 1o minutes steaming is about right. For a 2-lb fish, cook for about 16-20 minutes. Alana calls for Moi or other mild, white-fleshed fish. Make the sauce. In a small bowl, whisk together the sesame oil, soy sauce, sugar, and chili, if using. Set aside. Prepare the fish. Using a paring knife or chef’s knife, cut three or four 1-inch slits on each side of the fish through the skin to the bone. Pat the fish dry with paper towels. Season generously all over, inside and out, with salt and pepper to taste. Insert 1 piece of scallion and 1 coin of ginger in each slit. Stuff the fish with half of the remaining scallions and ginger. Stuff some cilantro into the cavity of the fish, too. Prepare the steamer bed. Lay the remaining cilantro, scallions and ginger on top of a steamer basket — I use a cooling rack. Place the fish on the bed of aromatics. Steam the fish. In a large wide pot, such as a wok with a lid, bring 2 inches of water to a boil over high heat. Carefully set the steamer basket inside. Pour the sake over the fish. Cover the pan. Reduce heat to medium or low, keeping the water at a simmer. Steam for 9-10 minutes (see notes above), until the flesh is opaque and easily flakes. Transfer the fish to a platter. Discard the aromatics. Finish the dish. Heat the oil in a small sauce pan over high heat until it starts to fizzle. Pour the oil over the fish. Return pan to burner and pour in the soy sauce mixture. Heat the sauce until it bubbles up — this will happen nearly instantaneously. Pour the sauce over the fish. Scatter the scallions, ginger, and cilantro over top. Note: When I made this on Instagram Stories, a number of people suggested I put the herbs on first, then pour the hot oil and sauce over them — will try this next time and report back. Serve with bowls of steamed rice.